Bacterial strains were isolated and characterized as Streptomyces coelicolar, Bacillus subtilis, Bacillus pumilus, Vibrio mimicus, Bacillus licheniformis, Pseudomonas fluorescens, Serratia marscesens, Bacillus marinus, Staphylococcus aureus, Actinopolyspora sp., Bacillus cereus, Bacillus thuringiensis and Lysinibacillus fusiformis. 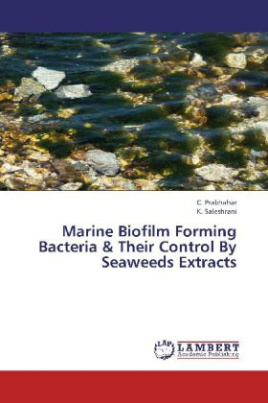 Among the 13 bacteria, Bacillus cereus, Bacillus thuringiensis and Lysinibacillus fusiformis were identified as superior biofilm formers sampled in the coast.Evaluation of antifouling potential in the crude extracts obtained in chloroform: methanol 1:1 (v/v) from red seaweeds Gracilaria edulis and Gracilaria verrucosa and Green, Ulva lactuca and Chaetomorpha linum was carried out against 10 biofilm forming bacteria isolated from the coast of Thondi. In general, the crude extracts of Ulva lactuca and Gracilaria verrucosa showed good inhibitory property against the all the biofilm forming bacteria isolated. Whereas, crude extract of Gracilaria edulis exhibited only trace activity against the biofilm bacteria Actinopolyspora sp., Staphylococcus aureus and Streptomyces coelicolar but against Serratia marscesens and Vibrio mimicus did not show any activity.